The accessories market for Apple devices is quite diverse, and considering its fashion-centric nature, is especially so for the Apple Watch. The variety of bands available allows the wearable computer to be used in a wide variety of events, occasions, and dress styles, but there is always room to push the envelope. 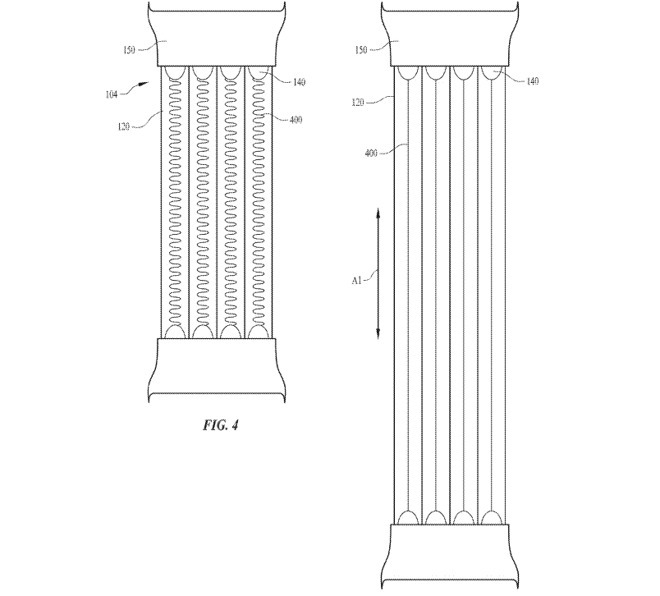 A patent granted to Apple on Tuesday for a "Watch glow light band", simply put, describes how light tubes can be used within the design of a band. Depending on the style of band used, there could be multiple tubes of light in both the top and bottom sections of the band, and could give the appearance of wrapping around the wrist. The light tube consists of the clear tube itself, a light fiber within the tube that runs its entire length, and a light-emitting diode at one end for illuminating the fiber, though it is also suggested an LED could be placed at opposing ends. There are many variations on the theme in the patent, including tubes with multiple LEDs, where the tube itself is made from extendable material and the light fiber is "helically coiled" within the tube, tubes with varying refractive indexes, and tubes with opaque and transparent sections. While the basic version may allow for predefined light levels and colors to pass through the tubes, Apple also suggests there could be some considerable customization options available, by taking advantage of the Apple Watch's screen to define individual tube colors. In one version, the colors could be based on a captured image from a camera embedded in the watch band itself. The use of clear tubes and multi-color LEDs would give the opportunity to change the color of the band to whatever the user wants, which would make one band seem more useful for multiple styles. For road users, including cyclists and runners, it may be more useful for night rides and running sessions, as a bright wristband would make them more visible to other road users. An illustration of the helically coiled light fiber within an extendable light tube in the watch band. While Apple does file numerous patents on a weekly basis, it isn't a guarantee that the concepts described in a patent make their way into a consumer product. This is certainly not the only instance of Apple considering alternative Apple Watch band applications, but is likely to be considered the most low-tech idea for the accessory so far. 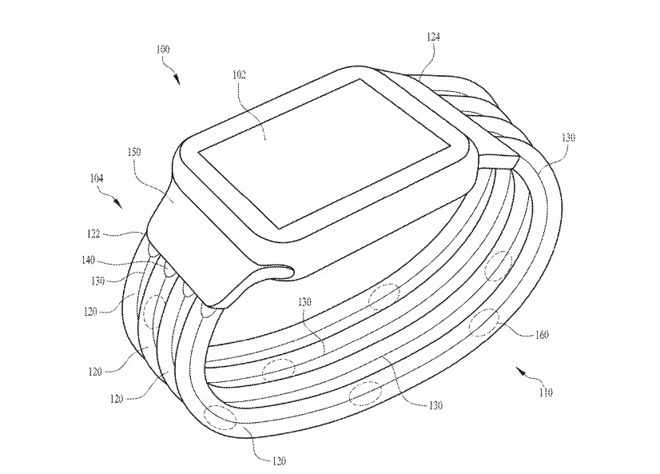 In November, a patent for an "Image-capturing watch" suggested the use of cameras embedded into the watch band to allow for photographs to be taken, or for use as a FaceTime camera for video calls. Given that system, and the mentions of a camera for band color selection in the above patent, it is plausible the two ideas could be combined together into one band. 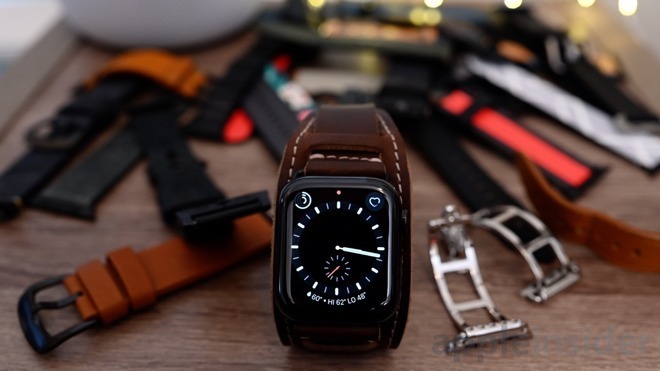 Apple has also considered the possibility of adding other indicators to the band, allowing users to see a basic status for various items without using the main Apple Watch display. Outside of indicators, Apple has looked into a multitude of other Apple Watch additions for the band, such as extra sensors, batteries, hiding components in bracelet links, self-adjusting bands with an onboard tensioner, back plates adding more functions, and the often-rumored non-invasive glucose monitoring system.